What can we do to prevent Alzheimer’s disease and how can we ensure that it is detected and monitored earlier? It is estimated that 46.8 million people worldwide are living with Alzheimer’s disease in 2015, which is a considerable increase from 35.6 million in 2010. Alzheimer’s Disease International expects this number to double every 20 years so it is really important that ways to reduce risk in the population are actively pursued. The scientific understanding of dementia has only recently shifted from that of a late-life disease to that of a lifelong process which is affected by factors throughout life. A recent analysis found that as much as half of risk for Alzheimer's disease is due to potentially modifiable factors (Barnes & Yaffe 2011). The effect of these factors can be considerably reduced, either by making changes in lifestyle, or by making sure that disorders such as depression and diabetes do not go undetected and untreated. That dementia is, in part, preventable is an important public health message (Barnett et al. 2013). 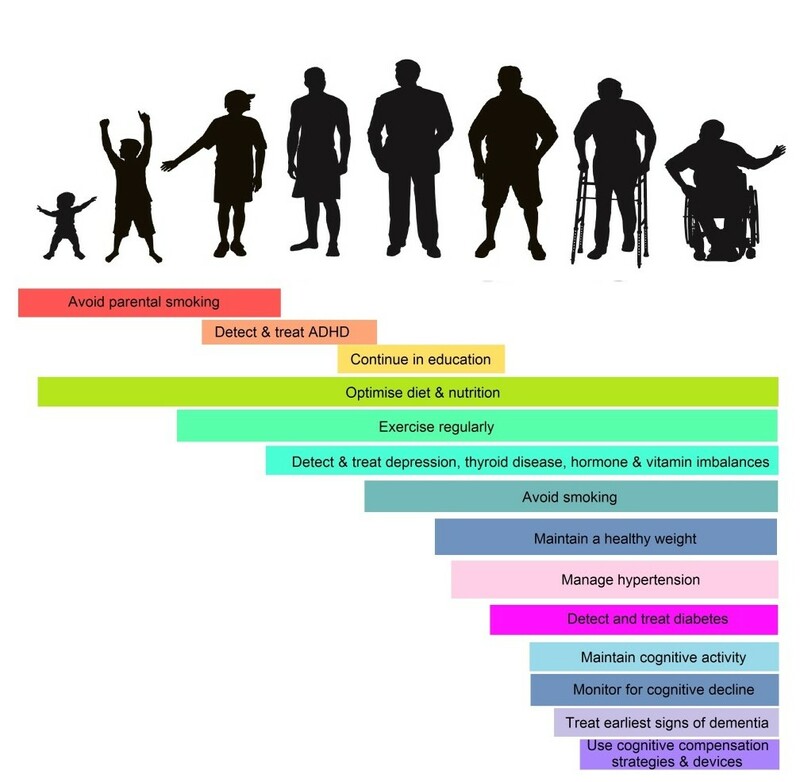 Here we review the seven key modifiable risk factors which can help prevent Alzheimer's throughout life. We all know that exercise and physical activity supports a healthy heart and increasingly it is recognised as crucial too for healthy brain function, including cognitive function, throughout life. There is also emerging evidence that exercise can improve cognition in people who already have cognitive impairment. For example, exercise has been reported to improve mild cognitive impairment (Barnes 2015), and in 2011 CANTAB was used to show that non-aerobic movement over 6 weeks produced significant improvement in sustained attention and visual memory in AD (Yágüez et al. 2010). Following this (Farina et al. 2014) found using CANTAB that physical activity can have a positive effect on cognitive decline in AD. Raised blood pressure or hypertension is a huge risk factor for stroke and cerebrovascular disease. Its role as a pre-cursor to other neurological conditions, including Alzheimer’s, is sometimes overlooked despite there being clear links between hypertension and impaired cognitive function (Duron & Hanon 2008; Louis et al. 1999; Kilander et al. 1998). As with physical activity, what’s good for the heart is good for the head: so it probably comes as no surprise that being very overweight increases risk for Alzheimer’s and other dementia-related diseases. But it is perhaps more surprising that the specific types of food we eat can affect our risk of Alzheimer’s disease, particularly the Mediterranean diet – a diet rich in fruits, vegetables, legumes and cereals and low in meat, sugar and saturated fat which is thought to considerably reduce risk (Sofi et al. 2010; Scarmeas et al. 2009). Research has shown that those with fewer years of formal education are at higher risk for Alzheimer’s and other dementias than those with more years of formal education. (Sando et al. 2008; Stern n.d.) Scientists believe that having more years of education helps to create a “cognitive reserve” that enables patients to better compensate for changes in the brain resulting from Alzheimer’s or other neurological diseases, essentially masking the symptoms for longer than in people with less education. It’s well known that smoking is bad for your health, but perhaps less well known that it is associated with risk for Alzheimer’s. And a meta-analysis of 19 studies of people with dementia followed for at least one year showed that those who smoked at baseline showed greater cognitive decline at follow up. (Anstey et al. 2007). Diabetes, and its treatments, can impact the brain and cognitive function, making it another risk factor for Alzheimer’s disease. A systematic review and meta-analysis of studies showed that people with diabetes are at higher risk of Alzheimer’s (Lu et al. 2009). If drugs were available to improve cognitive deficits, could this slow decline? Download our white paper on cognition and diabetes. Whilst these are not a complete or final list of the many risk factors of Alzheimer’s disease, they are reasonable places to start in adjusting lifestyles to lower risk for Alzheimer’s disease. Clearly, further studies are still needed to understand how these and other lifestyle factors affect risk of Alzheimer’s disease, and how reduction in these risk factors among those who already have some impairment might lower the conversion rates to Alzheimer’s and other dementias. We believe that a key factor in preventing the onset, or worsening, of Alzheimer’s and other dementias is the ability to accurately monitor memory and other cognitive functions throughout later life. 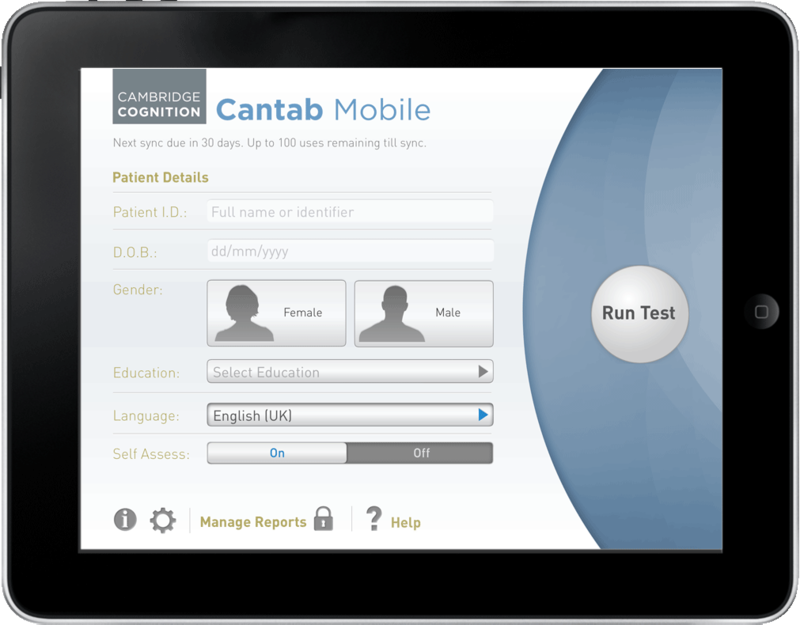 CANTAB Mobile is a simple to use medical app available to GPs to objectively assess memory in older adults who are worried about their risk for dementia. While no cures are yet available, there are a number of reasons why detecting mild cognitive impairment early may be useful to patients and families – including helping them to put plans in place for the future. Six reasons to detect mild cognitive impairment early. Anstey, K.J. et al., 2007. Smoking as a risk factor for dementia and cognitive decline: a meta-analysis of prospective studies. American journal of epidemiology, 166(4), pp.367–378. Barnes, D.E. & Yaffe, K., 2011. The projected effect of risk factor reduction on Alzheimer’s disease prevalence. Lancet neurology. Available at: http://www.ncbi.nlm.nih.gov/pubmed/21775213. Barnes, J.N., 2015. Exercise, cognitive function, and aging. Advances in physiology education, 39(2), pp.55–62. Available at: http://advan.physiology.org/content/39/2/55.abstract [Accessed September 7, 2015]. Barnett, J.H., Hachinski, V. & Blackwell, A.D., 2013. Cognitive health begins at conception: addressing dementia as a lifelong and preventable condition. BMC medicine, 11, p.246. Available at: http://www.pubmedcentral.nih.gov/articlerender.fcgi?artid=3832877&tool=pmcentrez&rendertype=abstract. Duron, E. & Hanon, O., 2008. Hypertension, cognitive decline and dementia. Arch Cardiovasc Dis, 101(3), pp.181–189. Available at: http://www.ncbi.nlm.nih.gov/entrez/query.fcgi?cmd=Retrieve&db=PubMed&dopt=Citation&list_uids=18477946. Farina, N., Rusted, J. & Tabet, N., 2014. The effect of exercise interventions on cognitive outcome in Alzheimer’s disease: a systematic review. International psychogeriatrics / IPA, 26(1), pp.9–18. Available at: http://www.ncbi.nlm.nih.gov/pubmed/23962667. Gillette-Guyonnet, S., Secher, M. & Vellas, B., 2013. Nutrition and neurodegeneration: epidemiological evidence and challenges for future research. British journal of clinical pharmacology, 75(3), pp.738–55. Available at: http://www.pubmedcentral.nih.gov/articlerender.fcgi?artid=3575940&tool=pmcentrez&rendertype=abstract. Green, R.C. et al., 2003. Depression as a risk factor for Alzheimer disease: the MIRAGE Study. Archives of neurology, 60(5), pp.753–9. Available at: http://archneur.jamanetwork.com/article.aspx?articleid=784148 [Accessed October 8, 2015]. Kilander, L. et al., 1998. Hypertension Is Related to Cognitive Impairment : A 20-Year Follow-up of 999 Men. Hypertension, 31(3), pp.780–786. Available at: http://hyper.ahajournals.org/content/31/3/780.abstract [Accessed October 8, 2015]. Louis, W.J. et al., 1999. Use of neuropsychological tests (CANTAB) to assess cognitive effects of antihypertensive drugs in the elderly. Journal of Hypertension, 17, pp.1813–1819. Lu, F.-P., Lin, K.-P. & Kuo, H.-K., 2009. Diabetes and the risk of multi-system aging phenotypes: a systematic review and meta-analysis. PloS one, 4(1), p.e4144. Available at: http://www.pubmedcentral.nih.gov/articlerender.fcgi?artid=2607544&tool=pmcentrez&rendertype=abstract. Porter, R.J. et al., 2003. Neurocognitive impairment in drug-free patients with major depressive disorder. The British Journal of Psychiatry, 182, pp.214–220. Available at: http://www.ncbi.nlm.nih.gov/pubmed/12611784. Sando, S.B. et al., 2008. Risk-reducing effect of education in Alzheimer’s disease. International Journal of Geriatric Psychiatry, 23(11), pp.1156–1162. Available at: http://www.ncbi.nlm.nih.gov/pubmed/18484674 [Accessed October 8, 2015]. Scarmeas, N. et al., 2009. 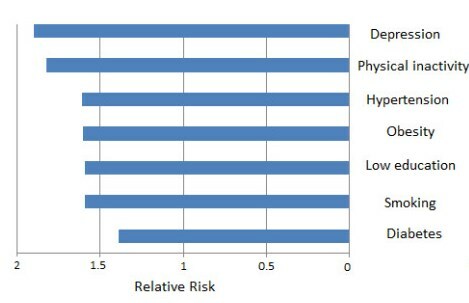 Physical activity, diet, and risk of Alzheimer disease. JAMA : the journal of the American Medical Association, 302(6), pp.627–637. Available at: http://www.pubmedcentral.nih.gov/articlerender.fcgi?artid=2765045&tool=pmcentrez&rendertype=abstract. Sofi, F. et al., 2010. Accruing evidence about benefits of adherence to the Mediterranean diet on health: an updated systematic review and meta-analysis. The American journal of clinical nutrition, 92(5), pp.1189–1196. Available at: http://www.ncbi.nlm.nih.gov/pubmed/20810976. Stern, Y., Cognitive reserve and Alzheimer disease. Alzheimer disease and associated disorders, 20(2), pp.112–117. Yágüez, L. et al., 2010. The effects on cognitive functions of a movement-based intervention in patients with Alzheimer’s type dementia: a pilot study. International journal of geriatric psychiatry, (2003). Available at: http://www.ncbi.nlm.nih.gov/pubmed/20878665.